Singapore – Raffles Fashion Designers Sean Loh and Sheila Agatha Wijaya stole the limelight of the extravagant affair at DesignS Gala Dinner and Awards Nite 2015 held on 13 March 2015 at the Marina Bay Sands. The fashion show featured Sean&Sheila collection which enthralled the audience including Guest-of-honour Ms Grace Fu, Minister in the Prime Minister’s Office, Second Minister for the Environment and Water Resources and Second Minister for Foreign Affairs, industry professionals and renowned contributors in the Design industry. Hosted by the Design Business Chamber Singapore (DBCS) with support from DesignS, the highly anticipated event was graced by Guest-of-honour Ms Grace Fu and nine partner design associations under DesignS. Contributors in the design industry also participated in the joint celebration of design excellence and the unity of local Design industry. “Sheila and I were honored to be chosen among many other talented designers groomed by Raffles. In my opinion, this fashion show was much more intimate as compared to the other fashion shows where the stage was bigger and further away from the audiences. Guests at this dinner were able to have a closer look at our collection. Most importantly, we were able to network with the important people in the design industry.” said Raffles Fashion Designer Sean Loh, founder of Sean&Sheila. With the continual support from Raffles industry partners such as Majolica Majorca and Mahogany, makeup and hairstyling sponsors, the fashion show was a great success! In line with the event theme “A Splash of Red”, their collection “Butoh” was inspired by traditional Japanese dance “Butoh”. They infused pops of red, shimmering grey, black and white, and traditional elements into today’s modern fashion. Through their collections, they portrayed what they felt while watching the dance and at the same time, recreated traditional Japanese uniform. 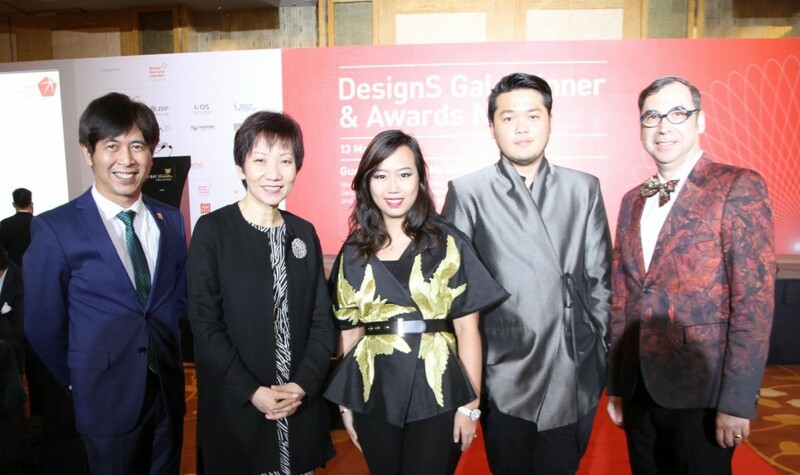 In conjunction with Singapore Design Week, the event was similar to the ‘Oscars’ of the local Design industry as prestigious awards such as “The Singapore Design Awards”, “The Singapore Good Design Mark”, “SG50 Special Edition Awards” and “The CSR Awards” were conferred to many design talents. The awards aim to recognise and honour the works that push Singapore forward as a creative hub. DBCS also celebrated their 30th anniversary by presenting tokens of appreciation to the past presidents of DBCS for their contributions over the years, including Raffles Designer Lawrence Chong was the President of DBCS from 2009 to 2013. Lawrence contributed significantly to Singapore’s design landscape and played a vital role as a leading voice representing the community.